Taste test: These potato chips tasted like exactly what they were supposed to, as they were packed with a strong roasted and seasoned chicken flavor, a very nice taste. 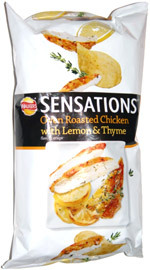 The taste was so strong that it overwhelmed the potato, and all you could really taste was the chicken, lemon and thyme. Some tasters were surprised by how authentic the chicken taste was. 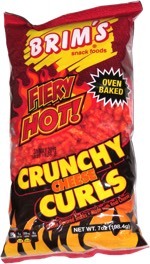 The chips were thin cut and very crisp, with a very nice crunch. One of the chips in the bag was absolutely enormous, and very few of the chips were broken, despite the fact that this bag traveled extensively around Europe on many trains, buses, boats and subways, then on a transcontinental flight and on three lines of Boston's MBTA, before being opened. Smell test: Strong chicken smell with all of the spices.